Buoyed by consumer attention to health and sustainability trends, worldwide pasta consumption is up for the second year in a row in 2017. Following a +2.3 percent increase in 2016, the industry is seeing a continued positive trend in global pasta sales of +0.6 percent, according to data from The Nielsen Company. This positive momentum is influenced by consumer attitudes showing an increased interest in wellness, and a sustainable approach to eating. As a plant-based food, pasta has an extremely low environmental impact, making it especially attractive to consumers. Another area of advantage for pasta is that it is energy dense, and easy to store and distribute. Pasta manufacturers are also offering innovative products needs such as organic, whole wheat and gluten-free pastas, providing consumers with additional options. A delegation of international pasta companies and Associations discussed the state of the pasta industry, and ways to promote pasta consumption and consumer awareness of pasta benefits in a healthy lifestyle at the International Pasta Organisation (IPO) Board Meeting, taking place in conjunction with the UNAFPA and Semouliers Annual General Assemblies and the European Flour Millers Congress in Prague, May 24-26, 2018. The meeting brought together all the major companies involved in the European flour, semolina and pasta businesses. The most dynamic growth markets are in Asia (+8.6%) and Africa (+2.6%) but pasta trends are positive also in Europe. In France, per capita pasta consumption is now 8.1 kg, and in Germany about 7.7 kg per capita, based on IPO data. While the British eat less pasta (3.5 kg per capita), an analysis by the Department for Environment, Food and Rural Affairs (DEFRA) shows that they do eat pasta once a week and pasta consumption has almost tripled since 1974. And what about the rest of the world? The U.S. is the largest pasta market, with 2.7 million tons of pasta consumed, according to data from the National Pasta Association. The average American consumes nearly 9 kg of pasta annually. According to IPO data, Italians are by far the heaviest pasta consumers, with a per capita consumption of 23.5 kg, 1.4 million tons in total. Next in line: Tunisia (17 kg), Venezuela (12 kg), Greece (11.1 kg), Chile (9.4 kg) with Argentina, Turkey and Iran all around 8.7-8.5 kg per capita, followed by Portugal and the Czech Republic (6.5 kg). Brazilians eat 5.8 kg per year, with Brazil being the third largest pasta market worldwide (1.2 million tons). 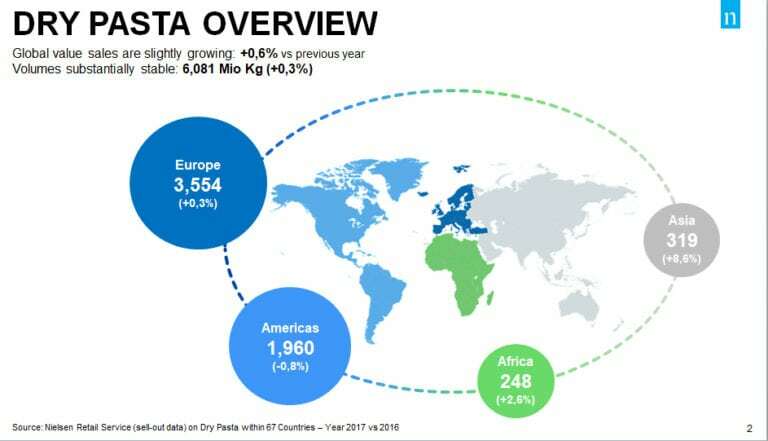 More details about pasta market trends and additional data will be presented by Nielsen at the 2018 World Pasta Day event that will take place in Dubai this fall. Since 1998, this annual industry celebration has been held on October 25, and recognizes the important role pasta plays in helping to feed the world through a variety of healthy, sustainable and tasty dishes. As part of the celebration, which marks its 20th Anniversary, countries around the world will join together for the 2nd Annual “The Power of Pasta” initiative, a coordinated program where donations of pasta are made to local organizations fighting hunger. Last year, more than 3.5 million plates of pasta were donated around the world.